And no, westerners cannot afford to say that all these lies and manipulated disinformation are the fault of Western Lying Media! Or the fault of the Imperialism! No, the fault is yours Western sheep-like humans. You ask and beg to be deceived, over and over again! As Noam Chomsky argues, me have now more propaganda and manipulation than ever before but, at the same time, never before we had so much information and so easy access to information. Therefore, the conclusion can only be one, a very simple one: the responsibility for this Orwellian situation we live in, in the West and its client states, lies on the intellectually laziness and on the hypocrisy of those willing to be deceived. The populace watch the footage and then, unconsciously but also consciously, interprets it the way they were conditioned to interpret it. The media tells them peaceful French demonstrators brutally beaten by deranged French policemen are “hooligans”, and the populace concedes. The media tells them that one of the countries with the highest levels of freedom of expression (freedom to even call for illegal coups or to call for the death of elected presidents) is a horrible repressive regime, and the populace concedes. But let’s go back to the crowds supporting Maduro and the Venezuelan government, democratically elected half a year ago. The democratic process and the immense support the Venezuelan gave to Maduro, once again, has not been televised. 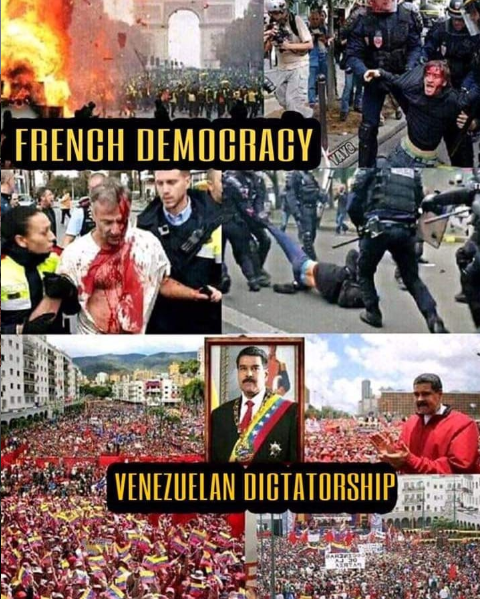 The masters of Western manipulation willingly omitted all these facts and, as a natural consequence, the Western populace didn’t notice the Bolivarian revolution moving forward. I remember that in 2012, during the anti-government demonstrations in Portugal, there were, altogether, more than half a million persons. And what did the media tell us at that time? They told us it was nothing but a minority of Portuguese troublemakers trying to screw things up instead of going to work. If 500,000 persons out of 10.5 million represent a voiceless and lazy minority, what can you tell me about demonstrations with a few thousand anti-Maduro protesters (sometimes tens of thousands, on special occasions) in a population of 32 million Venezuelans? Is your math failing dear westerners? Or is your reasoning failing? I bet both are failing in Western submissive and gullible minds. That’s why they swallow figures of “80% of Venezuelans supporting Guaidó”, scandalously made up by the Portuguese state channel RTP. Why tell the truth, and check it out, when you can make it up without suffering any consequences or without having the populace complaining about it, right? Good for you deceivers and deceived ones! Bravo! Luis Garcia is a self-made independent writer and traveler, focused on Syria and Venezuela. He also writes about Latin America and the Middle East, and about the propaganda machine of what he calls Western Economic Dictatorship. His articles can be read in English here, in French here and in Portuguese here. Luis Garcia traveled in 55 countries and lived in 10 of them, currently living in Thailand where he works as a teacher. He is also an amateur photographer, with his best photos published here. Please support his work at his Patreon account.